I managed to upload data to OSM servers using JOSM—though I had to patch it for Cyrillic usernames (well, any non-Latin-1 characters). 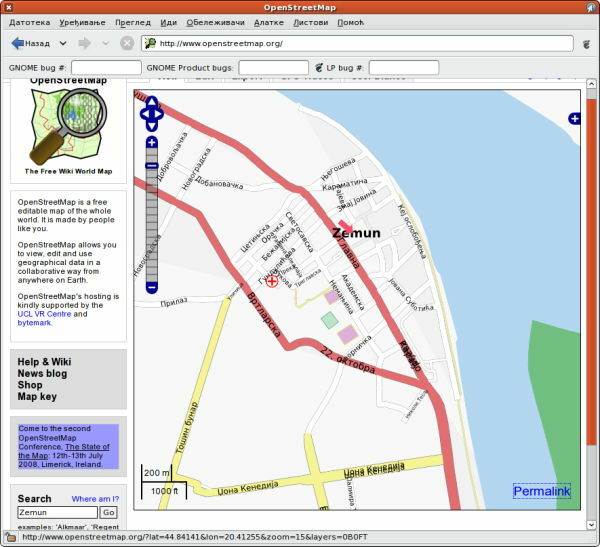 Thanks to Bruce Cowan for pointing me in the right direction earlier when it came to uploading existing OSM files. Thus, I was able to map most of Zemun's Donji Grad (and a few nearby streets of Novi Beograd), but with a few problems I can't seem to be able to solve. The biggest issue I am running into is joining ways—some of them seem to not look like intersections, yet they share a node. At least when rendered with mapnik—osmarender looks fine. Osmarender looks better: or at least doesn't show the same defects? I'd really like to resolve this, because I want these streets to be actually connected. I've tried inserting 'junctions', but that didn't help. Any suggestions? Other thing I wonder about is about alternative names, and localised names (for streets and objects). I am making use of old_name, name:en and name:sr tags, but I couldn't find any official policy on naming. I have so far defaulted to using Serbian Cyrillic for street names, but will soon switch them to Latin script, and put Serbian as name:sr tags. 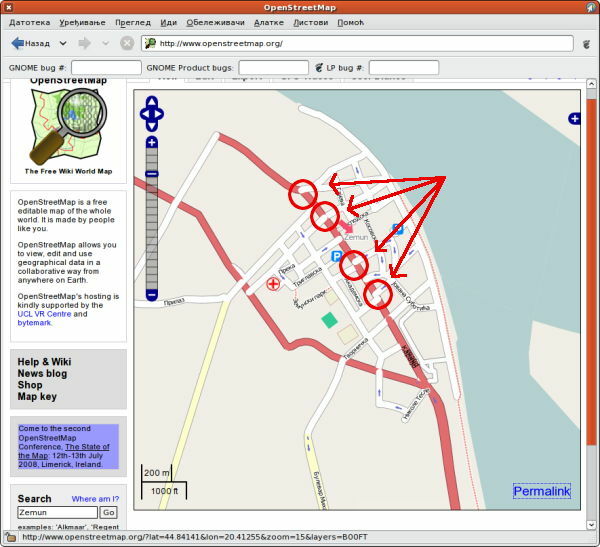 I suspect search on OpenStreetMap will return both, but will need to wait for confirmation for a few days. I am also still hoping to render Cyrillic names, though, so I may need to set up a separate tile generator on my own server. Or not? Yay for blind USA imperialism! @danilo: the name tag should have the local name in local script, so Serbian Cyrillic is good. In places where there is more than one official language, it means that the name tag has more than one name. about the junction rendering: I can't see anything wrong with it. The junctions are well connected. The only thing I'm not sure of is your usage of the landuse tag on highway, landuse is for areas. You could use the abutters tag for what you want to do. Mapnik has specific rules for rendering primary on top of residential roads, so this really shouldn't happen. The only thing I can think of is that the landuse tag messes that up somewhat, but even that shouldn't do it... But it strikes me that the primary roads that render correctly are the ones without the landuse tag. As far as naming goes, I'll go with Serbian Cyrillic for 'name', and add 'name:en' for Serbian Latin names: hopefully that will do for those doing searches with Latin alphabet. As far as titlecasing goes, I never thought of doing that, and boy, would it look ugly and out-of-place with Serbian (so, I can understand your frustration, Nicolas :)). Since I haven't found anything resembling a naming policy for OpenStreetMap, I wouldn't worry about it, but if you ever need a hand in convincing someone that titlecasing is silly, I'd be welcome to chip in. I'm just getting started with OSM but it seems Russia uses cyrillic, Israel uses hebrew etc and it all shows up as expected on the main osm mapnik tileserver so if cyrillic is what you'd use locally I'd go for it. This seems to be backed up by http://wiki.openstreetmap.org/index.php/Map_Features#Naming which suggests following whatever the local street signs use. a) they have both name:ja and name:ja_rm as well as name:en for some with rm (romaji?) being the romanised version. c) neither mapnik nor osmarender get the non-roman version right, both breaking in different ways. d) the tiles@home tileserver used by default on openstreetmap.jp does better with the japanese, but seems to not have the ability to stop names colliding when clustered too close. Serbian Latin names probably should be name:sr@latn=*, as it isn't actually English. The name=* tag is the only one that is rendered (for now) however, so this should be the default for the area. For instance, the Western Isles off Scotland use Gaelic, so name=* is places' Gaelic names, and name:en=* is their English name. As far as I understood it from the wiki, name= should be used for the official name of a city/street/whatever as it is rendered by default. name:lang is also used in the search engine. I believe the correct OSM approach is to use what ever the street sign on the ground says, in what ever that language is. Use serbian in cyrillic if that's what it says. I'd advise against using name:en=* for latin transcriptions of serbian names. perhaps something like name:sr_latin=* or something.